Meet Argento 2 beta release: Most advanced Magento 2 template created ever. This entry was posted on April 5, 2016 by TemplatesMaster. Current release is still waiting to be improved and published. We keep on working hard on it. View a demo http://demomagento2.argentotheme.com/ of our first Magento 2 template and share your feedback at our blog. This will help us to create better release. You have great chance to see your ideas or requirements in final Argento Essence release. Hope, this will meet your expectations. So you’ve got options to easily add new sliders, product tabs, features products and product questions blocks. Rest of the modules which are part of Magento 1 edition will be added in next releases. The takeaway is that new M2 theme is available for download and purchase. Current release requires manual installation. It is quite easy and you can find installation instructions here. We are going to make better with the next release and provide you with an installer and additional designs which were part of Argento 1.7 edition. We’ll let you know. Can i order Argento 2 template now? 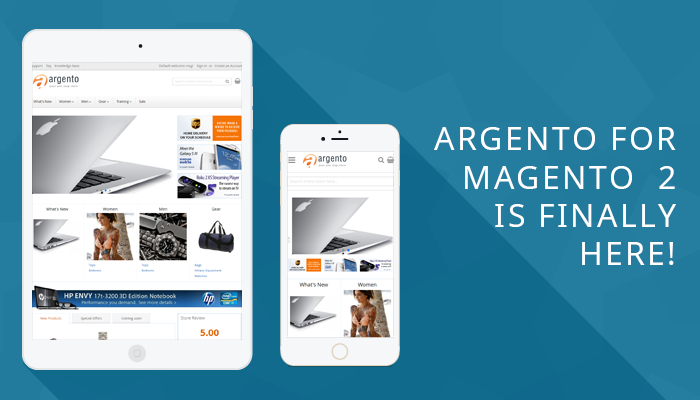 We currently use Magento 1.9.2.1 with your Argento template. Can you update us to Magento 2.0 and install the new Argento 2 template? Yes it can be done. Please contact our support at http://argentotheme.com/contacts so we can discuss more details. Hello. Where can I see Argento 2 modules list for magento 2? Current beta release is provided with next modules: Ajax Search and Autocomplete, Easy Catalog Images, EasySlide, Easytabs, Facebook Like Button, Highlight, ProLabels, Review Reminder, Rich Snippets, Sold Together, Testimonials modules. I like to buy your Argento 2 template. so can i buy this template now? If you already purchased version 1.7 is the upgrade to 2.0 free? If it's not, is there a reduced price to upgrade if you already bought the earlier version? You can get updates for free if you have active subscription. In other case you can contact our support in order to get discount. i dont undertand why in plain june 2016 you not have done your extension Fire Checkout for Magento 2. Then gift this extension for all cusomers who buy Argento for Magento 2. For incentivate the sales.